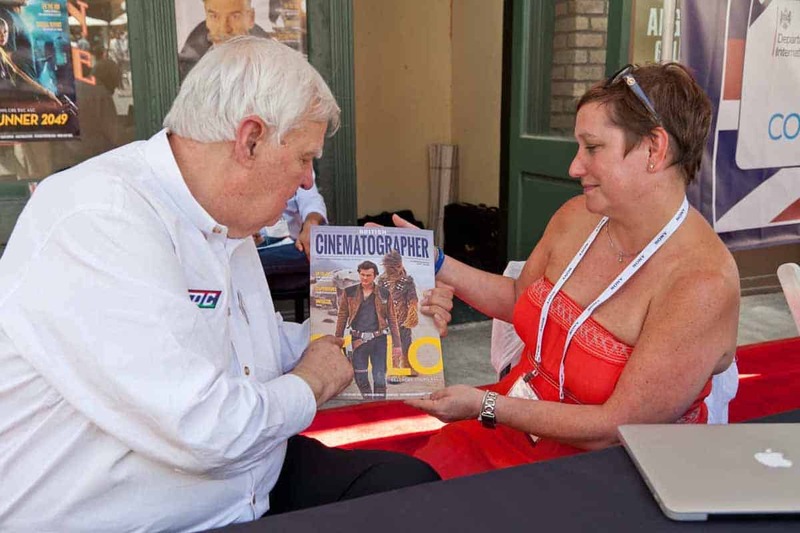 We are a tad later than usual with our pixel slinging, coming to you just after summer solstice, since we’ve recently wrapped up our annual sojourn on the magazine side, covering L.A.’s annual Cine Gear show. It seems to grow a bit more each year, becoming more like a further west, yet somewhat targeted NAB (about which, more in a minute). 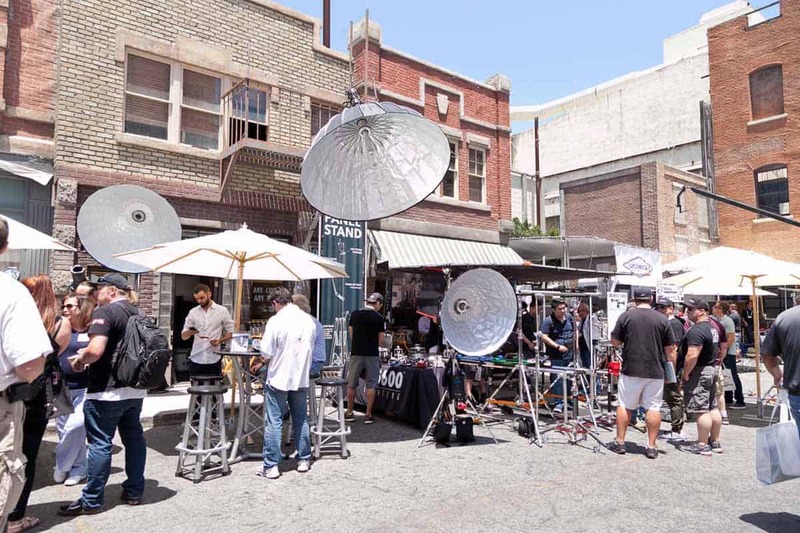 Except that while NAB is indoors at the Las Vegas Convention Center, and you trek through the sun to get there, at Cine Gear you remain n the sun (with the exception of a couple of soundstage areas), in the backlot, and particularly along New York Street, of Paramount Studios. Leading some to wonder whether that same backlot will be able to continue comfortably hosting this show as it grows. We’ve experienced our own version of that growth in covering it -- as more and more vendors come, there’s more to squeeze in, with the same approximate word count, in our magazine piece each year. And thus, when some of our film biz friends expound at greater length on how the show was, or where it might going, we don’t always have room for those comments. Or didn’t -- until Across the Pond’s arrival online, about a year ago, around the time of the previous Cine Gear. This may even be our anniversary column! Where’s the champagne cake!? 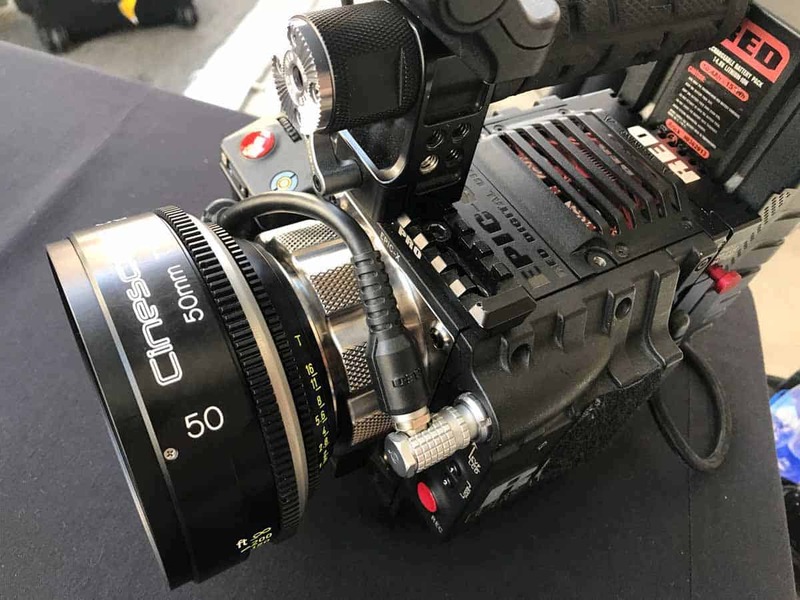 "Cameras like ARRI’s ALEXA, the Red Monstro, and Sony VENICE have made our lenses very popular, not to mention future proof." 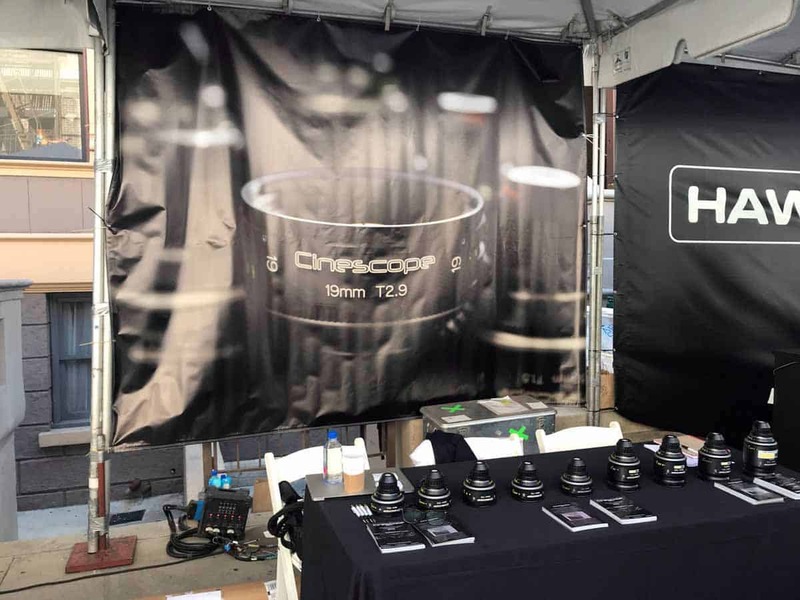 And since we can expound at greater length here, we can include things like the view from our pals at Cinescope Optics, which specializes in rehousing what we might call “storied glass,” such as the Leica R Lens. Future proof? A comforting concept indeed in this 21st century. But in this context, it meant “‘future proof,’ in the respect that as our lenses are full frame and we are in a great place for the foreseeable future of usability due to all the new full frame sensors coming to the market” -- such as those mentioned above. Expanding on what he meant by who was in the target zone, and who wasn’t, he said that previously they’d gone to NAB because “certain customers wouldn’t come to CIne Gear, because it wasn’t big enough.” But now, as we kept hearing from vendors at NAB, costs for that show are going up, and the show is becoming, if we can risk the lighting pun, diffuse. 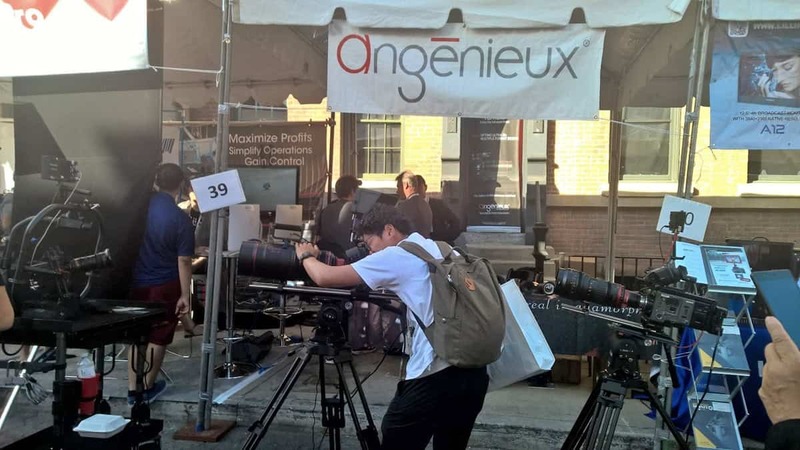 Then again, Cine Gear is planning to add another show to its LA and NY offerings, as it comes to Atlanta for the first time, this fall. 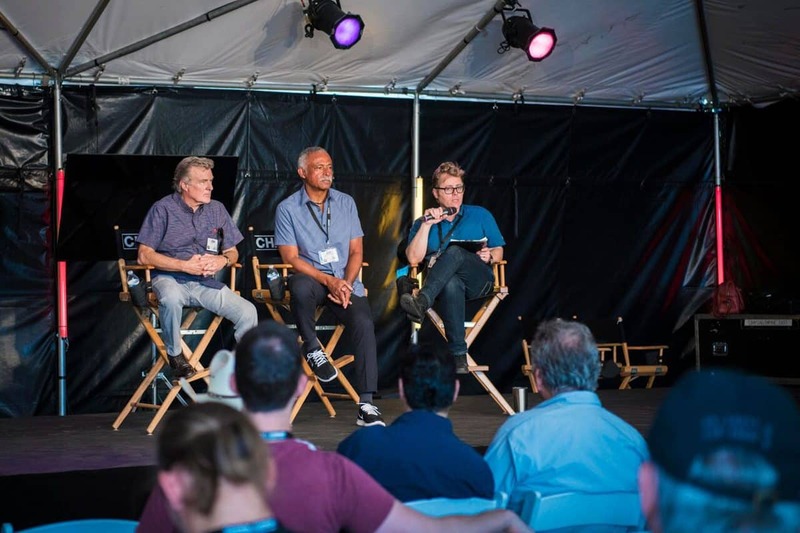 Whether that will similarly be worth exhibiting at, for those already making the BSC - NAB - Cine Gear - IBC circuit, remains to be seen. 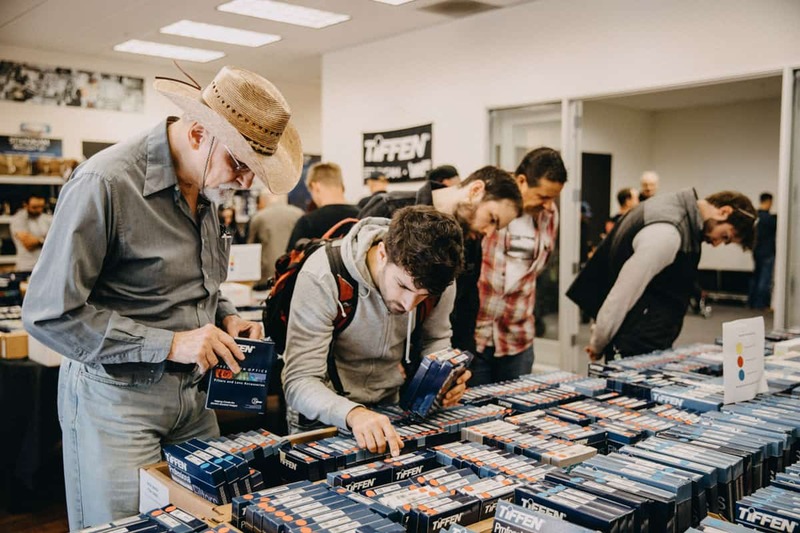 “You don’t need multiple trade shows in the same year in the same business,” he notes. It remains to be seen what the traffic will bear. Alan Lowne (BC publisher) with Steve Howard (MBS /Pinewood Lighting), Darren Smith (MD MBS/Pinewood Lighting) and Anthony Richmond BSC. Though traffic in Atlanta, certainly for the Pinewood studios there, and all the Disney/Marvel and other productions shot on those soundstages, remains rather thick for the foreseeable future. There, and the “original” Pinewood, across the pond from here, in the UK. 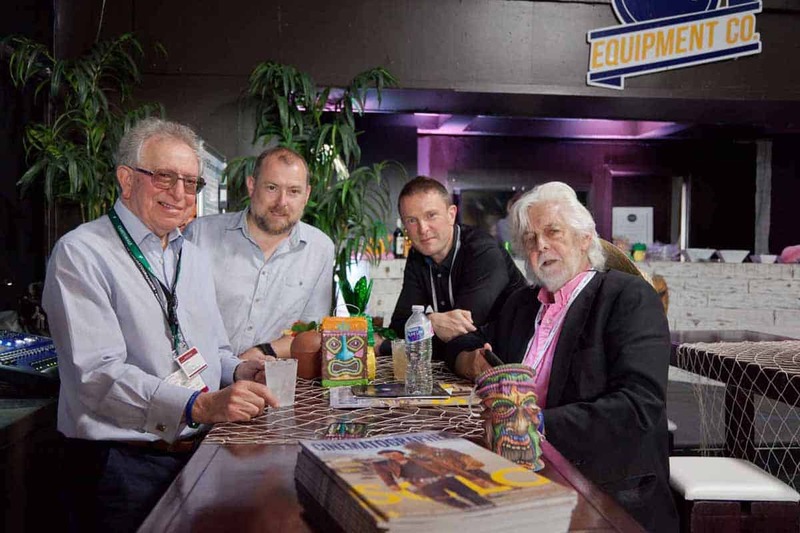 "It was particularly rewarding to see the high levels of interest generated at Cine Gear in the LED and low energy lighting technology that we are making available to crews all over the world." 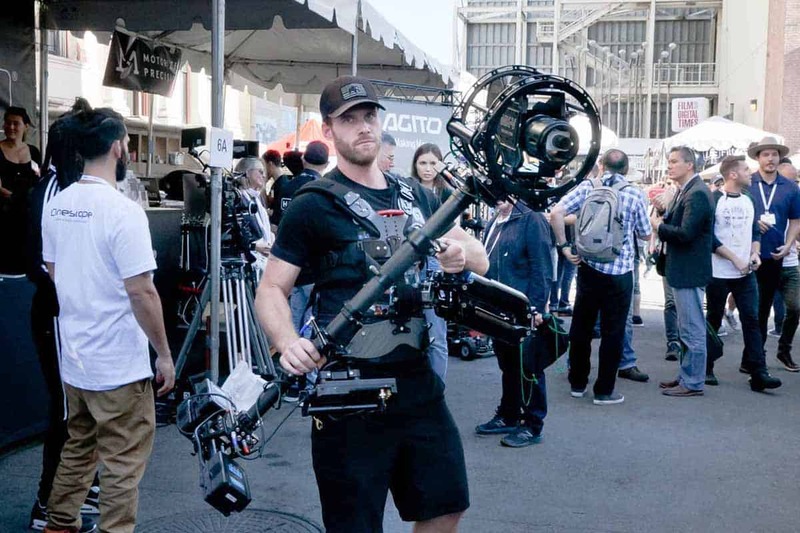 The MK-V Omega System is the perfect addition to a regular Steadicam. All of which, of course, are blurring more and more -- especially on the indie feature / TV drama side. As we’ve noted previously about NAB: If the “B” for “Broadcast” now also means “streaming,” and everything that’s “content” is now “streamed,” is NAB now a show about, well, “everything?” All the content everywhere? The “content” side of Cine Gear is still pretty clearly aimed at showing what kind of “Cine” the “Gear” can make. One notable example was a short that RED was showing, which they’d also produced, called Epoch. 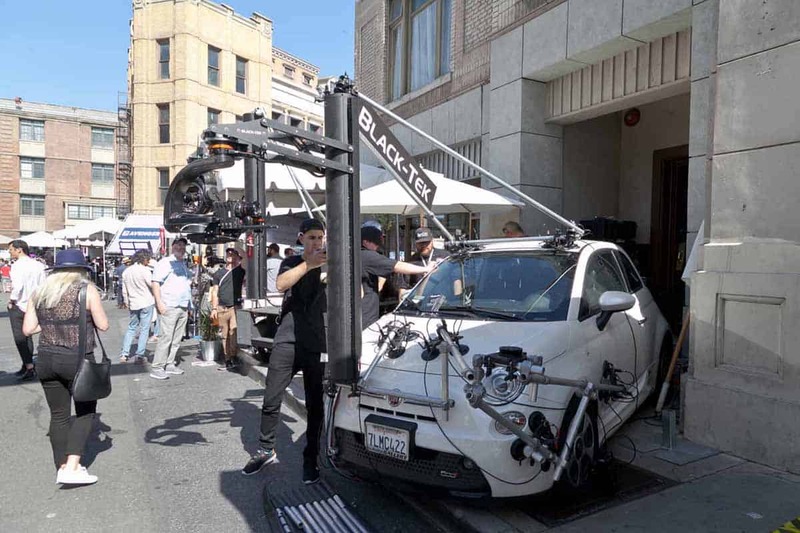 Designed to highlight the capabilities of the 8K MONSTRO sensor, it was written and directed by Rich Lee, known for a lot of his visual effects work, and shot by ASC’s Christopher Probst. 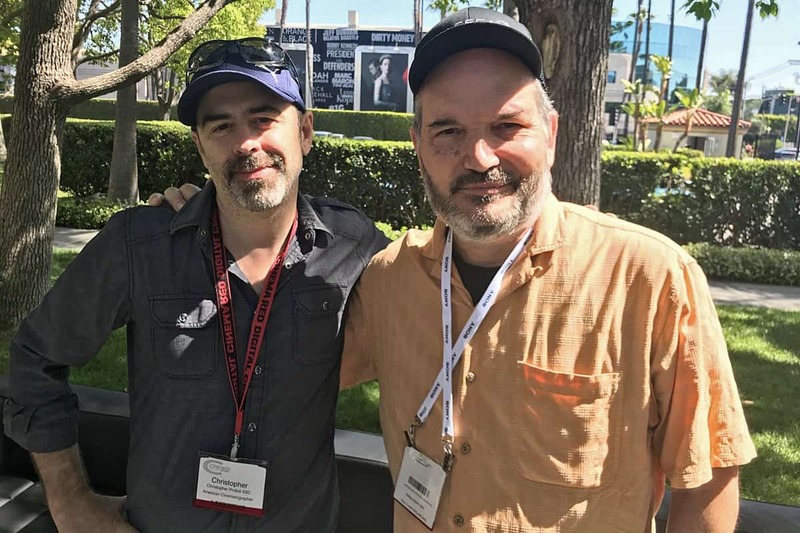 Though our numerous booth visits kept us away from a lot of Cine Gear’s programming track, we made up for it with an hour-long chat with Probst on a shady bench outside the main Paramount theater, as he took breaks between showings and panel sessions for the apocalyptic short -- wherein a woman looks for other survivors, both like, and unlike, herself. While we won’t be able to do full justice to the entire wide-ranging hour as we come up against word count, one of the many edifying aspects to the conversation was the way Probst wanted people to think of “pixels” when discussion things like 8k vs. 6k, resolution, etc. Which is to say, don’t think of them as “pixels” at all, but rather “sensels” -- a single sensor element of an array of sensors, each of which capture red, green, or blue data. From there, the discussion went into how the sensels will “average” colors between them, depending on the array (if half of them are green in a given area, say, then a quarter each will be given to blue or red, with the “averaging” between them), which brought us to “demosaicing,” an algorithm for a digital image process which reconstructs full color images from incomplete samples, usually coming from a sensor. Which gets us back into full frame and 8k land! It was all heady stuff, and in the hands of Lee and Probst, translated into a nicely gritty piece of short cinema, itself shot at an abandoned iron mine near Coachella, which Lee knew from his time working the VFX side of the underrated film adaption of Alan Moore’s Constantine. 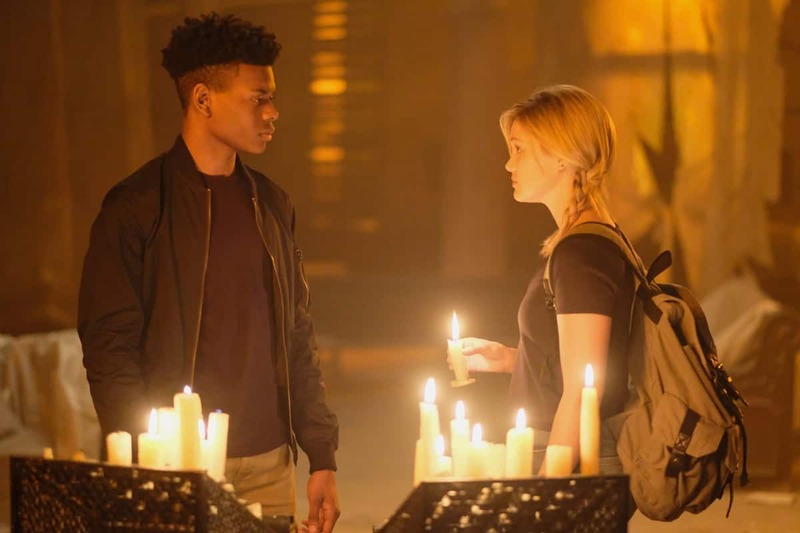 Exploring dark superhero themes similar to Constantine (and the entire palette of Epoch) is the new series Cloak and Dagger, on Disney’s Freeform network (formerly ABC Family). The pilot episode of the New Orleans-set, yin/yang tale of teens from opposite sides of the proverbial tracks, one male, one female, possessing dark and light powers -- which are stronger when used together -- was shot by Tami Reiker. “This is the fourth project I’d done with (director) Gina (Prince-Bythewood),” she told us. 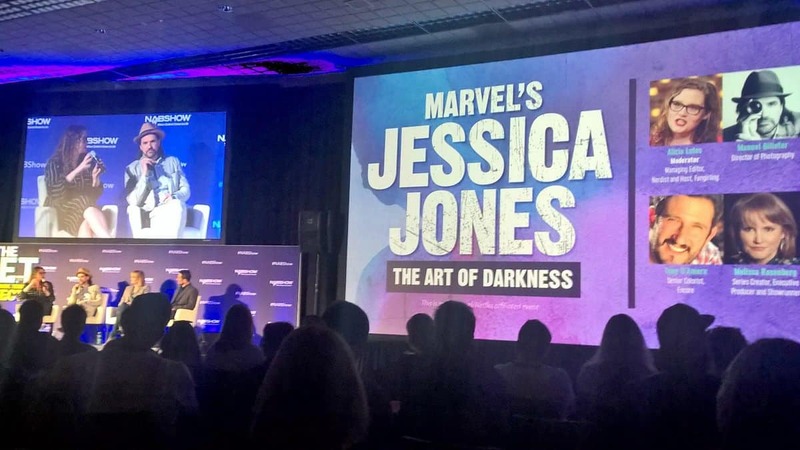 “We’re very tight and very connected.” For this particular Marvel adaptation, they wanted “an even more indie look than Jessica Jones, something that appealed more to teenagers,” which wound up meaning a lot of hand-held. In Reiker’s hands was an ALEXA Mini, which “you could strip down to twelve pounds -- you carry a little backpack” (with a grjp following close behind). Reiker operated the A camera, armed with not only the Mini, but one usually equipped with a Leica Cine lens. The details of which are about as secret as those franchises coming into the Pinewood stages. But if we’re talking about pilot episodes and series’ looks, that must mean that spring trade show season is giving way to summer’s Emmy buzz. About which, more over our next couple columns -- the ones between solstice and equinox. Anytime, though, is a good one to write us: AcrossthePondBC@gmail.com. We’ll see you in July.